Conor McGregor has managed to dodge jail time after being arrested for disorderly conduct in April this year. The mixed martial arts fighter was captured on video earlier this year attacking a bus full of UFC staff and fighters. Connor McGregor and his entourage were seen hurling objects in the bus. Two fighters were injured and had to miss their scheduled fights at UFC223. The notoriously rowdy MMA fighter has been given what most describe as a “slap on the wrist” sentence. The judge handed a light 5-day community service sentence, three days of anger management and recompense for the damaged property. He will not get a criminal record neither is he banned from any upcoming fights nor will he face travel or visa restrictions. Conor McGregor also has protection orders against him, he is not allowed near the two fighters injured during the April incident. A Russian fighter and lightweight champion, Khabib Nurmagomedov, who was in the bus has challenged Conor McGregor to a fight after leaning that Conor is free to fight. Bookmakers have not wasted anytime in getting in on the excitement. The fight is not official, and yet odds have already been released by several bookmakers. One has set odds already in favour of the Russian at 10-23 while another has 9-5 in favour of Conor McGregor. Although the fight has not been officially confirmed, UFC president Dana White has made statements which confirm that a fight is indeed on the cards. 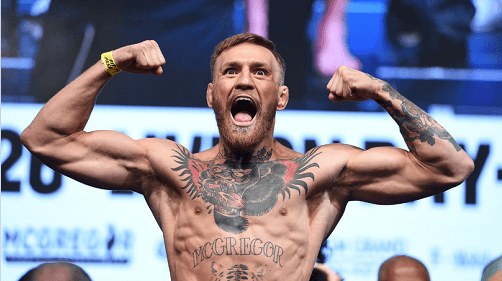 Speculations are rife that the fight will take place at the upcoming UFC229 in Las Vegas. Punters everywhere are definitely looking forward to this fight. Who will your money be on; McGregor or Nurmagomedov? While we wait for the big fight there is still something the charismatic and riotous fighter gives us to bet on- baby names. Conor McGregor and his wife are expecting their second child and bookies have already put out odds. Interesting name choices such as Money, Bus and Vegas are some of the names being bet on. It will be interesting to see what the winning name will be if any.